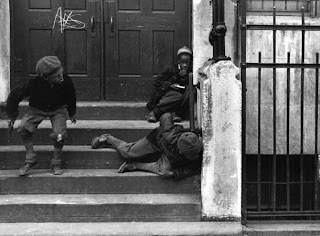 Helen Levitt was born August 31, 1913 and passed away March 29, 2009. She is well known for her str﻿eet photography throughout New York City. 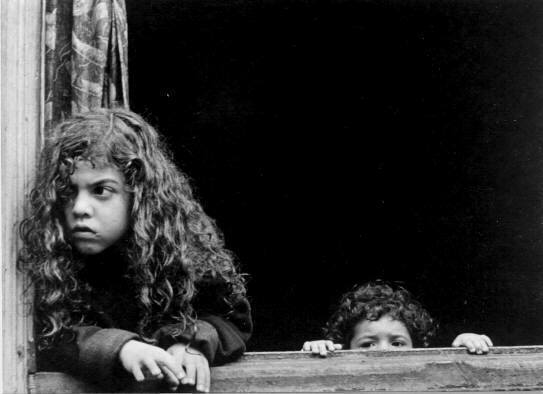 The images of the children that I found for her seems to portray children that are very angry, or maybe even afraid. The girl in the first picture appears to be worried, while the child next to her is trying to see through the window pane. The directional force through angles in this photograph work well to create a space, story, and time. The boys in the second picture appear to be angry or after someone. They seem to be holding something in their hands, and I can only hope it is not guns. I wonder if these are scenes that have been set up by the artist, or if she's portraying real life where children live in such fear and anger. We can only expect a horrible future for these kids if this is not an act. However, it is their struggle for survival.